New, comfortable cottage "Miralles", built in 2001, renovated in 2014, surrounded by trees and fields. House Equipment: air conditioning, solarium, laundry, washing machine (private use), tumble dryer (private use). Access & Parking: parking by the house. All-season motor access to the house. Situation: quiet position in the countryside. View from the apartment of the sea and the countryside. Surroundings of the house: grounds (private use, 3'500 m2, fenced), garden (private use, 600 m2), swimming pool (private use, length 7 m x width 5 m), outside shower (private use), children's playground (private use), barbecue (private use). Facilities and distances: shop 1 km, grocers 1 km, supermarket 1 km, restaurant 1 km, sandy beach 14 km. Please note, nearby is a motorway in 100 m.
Bright interior, traditional rustic Majorcan decoration. On arrival: welcome basket with coffee or tea, water, milk, juice.... Farm animals in a fenced area (hens, goats, ducks...). Comfortable, cosy cottage "Sini", built in 1999, surrounded by fields. House Equipment: air conditioning. Access & Parking: parking by the house. Situation: above Búger, quiet, sunny position. Surroundings of the house: grounds (private use, 7'100 m2), garden (private use, 80 m2), swimming pool (private use, open from 01.01. untill 31 .12. ), outside shower (private use), barbecue (private use). Facilities and distances: shop 1 km, grocers 1 km, supermarket 1 km, restaurant 1 km, sandy beach 14 km, golf course 10 km, tennis 14 km, riding stables 14 km. Situation: in the village. Access/parking: parking on the estate (roofed). Estate (private use): approx. 100 m², closed plot (wall), flagged floor. Outdoor facilities(private use): terrace (sun-blind), further terrace 25 m², further terrace, furnishing provided, transportable barbecue. Pool (private use): 7.0 x 2.0 m, 0.60 - 1.60 m deep, open throughout the entire season, salt water pool care. Pool area: 4 sun loungers, shower, WC. Please note: access to the pool via stairs (3 steps). Sports facilities/ leisure time: private use (free of charge): fitness gym. Important information: The fitness room is located in a separate building. Access by external stairs only. ● Distances: Center Santanyi in approx. 350 m. Campos in approx. 13 km. Palma in approx. 51 km. Next shopping possibility (Santanyi) in approx. 50 m. Next supermarket (Santanyi) in approx. 200 m. Airport Palma in approx. 46 km. Sea in approx. 4.5 km. Sandy beach in approx. 4.5 km (Cala Santanyi). Situation: rural. Access/parking: parking on the estate. Estate (private use): approx. 300 m² (whole estate 6500 m²) , partially self-contained (electric entrance gate), natural surroundings. The landlord lives on the neighbouring estate. (temporarily). Owner has poultry, sheep. Outdoor facilities(private use): terrace (roofed), further terrace 20 m², furnishing provided, transportable barbecue. Pool (private use): 6.0 x 3.5 m, open throughout the entire season. Pool area: sun loungers, external shower. ● Distances: Center S'Horta in approx. 1 km. Cala d'Or in approx. 5 km. Felanitx in approx. 15 km. Next shopping possibility (S'Horta) in approx. 1 km. Airport Palma in approx. 57 km. Sea in approx. 3 km. Sandy beach in approx. 3 km (Cala Sanau). Golf course Vall d'Or in approx. 4.5 km. Situation: in the village S'Horta. Access/parking: parking on the estate. Estate (private use): approx. 150 m², open plot. Outdoor facilities(private use): terrace 25 m², further terrace, furnishing provided, transportable barbecue. Pool (private use): 3.0 x 1.8 m, open throughout the entire season. Pool area: tiled, 4 sun loungers. Please note: access to the pool via stairs (5 steps). Important information: Access to the terrace over 8 steps. Exterior (private use): Plot description: Access to the house via stairs (5 steps). ● Distances: Center S'Horta in approx. 200 m. Cala d'Or in approx. 5 km. Campos in approx. 23 km. Next shopping possibility in approx. 200 m. Airport Palma in approx. 56 km. Sea in approx. 4 km. Sandy beach in approx. 4 km (Cala Sanau). Sandy beach in approx. 5 km (Cala d'Or). Golf course Vall d'Or in approx. 3 km. Situation: residential area La Fé. Access/parking: parking on the road near the house. Estate (private use): approx. 200 m², closed plot (hedge, wall), lawn, flagged floor. Outdoor facilities(private use): terrace 30 m² (partially roofed), balcony 7 m², furnishing provided, lounge furniture (permanently mounted), transportable barbecue. Pool (private use): 9.0 x 4.5 m, open throughout the entire season. Pool area: 8 sun loungers, sunshade, external shower. Please note: access to the pool via stairs (2 steps). ● Distances: Center Porto Colom in approx. 2 km. Manacor in approx. 26 km. Next shopping possibility (Porto Colom) in approx. 1.5 km. Airport Palma in approx. 58 km. Harbour/marina in approx. 1.7 km (Porto Colom). Sea in approx. 1.7 km. Beach in approx. 2.5 km (Cala Marcal). Golf course Vall d'Or in approx. 3.5 km. Situation: rural. Access/parking: parking on the estate. Estate (private use): approx. 1.5 ha, partially surrounded (wall), trees, natural surroundings, with plants. Outdoor facilities(private use): terrace 25 m² (roofed), furnishing provided, brick barbecue. Pool (private use): 8.0 x 4.0 m, open throughout the entire season. Pool area: tiled, 6 sun loungers, external shower. Sports facilities/ leisure time: private use (free of charge): table tennis table. ● Distances: Center Felanitx in approx. 6 km. Campos in approx. 8 km. Palma in approx. 48 km. Next shopping possibility in approx. 6 km. Airport Palma in approx. 41 km. Sea in approx. 15 km. Sandy beach in approx. 15 km (Cala Mondragó). Situation: rural. Access/parking: parking on the estate. Estate (private use): approx. 1.5 ha, closed plot (wall), natural surroundings, with plants, lawn, palm trees. Outdoor facilities(private use): terrace (roofed), furnishing provided, brick barbecue. Pool (private use): 8.0 x 4.0 m, open throughout the entire season. Pool area: tiled, 6 sun loungers, 2 sunshades, external shower. ● Distances: Center Felanitx in approx. 6 km. Campos in approx. 8 km. Palma in approx. 48 km. Next shopping possibility in approx. 6 km. Airport Palma in approx. 41 km. Sea in approx. 15 km. Sandy beach in approx. 15 km (Cala Mondragó). Situation: rural. Access/parking: parking on the estate. The garage is locked. Estate (private use): approx. 600 m² (whole estate 1.5 ha) , partially self-contained (fence), trees, with plants, lawn., Outdoor facilities(private use): terrace 10 m² (roofed), furnishing provided, brick barbecue. Pool (private use): 7.5 x 4.0 m, open throughout the entire season. Pool area: 6 sun loungers, external shower, WC. Exterior (private use): Distances: Next village/town: Center Felanitx in approx. 3 km Ca's Concos in approx. 3.5 km Campos in approx. 16 km, Shopping: Next supermarket in approx. 3 km, Arrival: Airport Palma in approx. 49.5 km, Beach/waters: Sea in approx. 11 km Sandy beach in approx. 11 km (Cala d'Or). Local service charges Holiday resort tax. Linen/towels Linen/towels available. Deposit € 200 (in cash). Toddler bed/​High chair free of charge (on order). Pet 1 pet allowed (please advise prior to arrival; additional pets on request only). Situation: solitary, panoramic view. Access/parking: gravel road, approx. 100 m, steep. parking on the estate. Estate (private use): approx. 900 m² (whole estate 1.8 ha) (entrance gate), trees, with garden, garden, gravel, flagged floor, palm trees. Outdoor facilities(private use): terrace (roofed), further terrace, reserved open space, furnishing provided, brick barbecue. Pool (private use): 45 m², open throughout the entire season, curved shape. Pool area: sun loungers, sunshade, external shower. ● Distances: Center Felanitx in approx. 4.5 km. Ca's Concos in approx. 7 km. Palma in approx. 65 km. Next shopping possibility (Felanitx) in approx. 4.5 km. Sea in approx. 15 km. Sandy beach in approx. 15 km (Cala d'Or). Golf course Vall d'Or (18-hole golf course) in approx. 13 km. Situation: residential area. Access/parking: garage. Estate (private use): approx. 1500 m², closed plot, in a hillside, trees, natural surroundings, flagged floor, fruit trees. Outdoor facilities(private use): terrace 40 m² (roofed), further terrace 30 m², furnishing provided, transportable barbecue, summer kitchen (dining area, hob, refrigerator). Pool (private use): 10.0 x 5.0 m, open throughout the entire season. Pool area: tiled, sun loungers, sunshades. ● Distances: Center Cala Murada in approx. 1 km. Felanitx in approx. 16 km. Palma in approx. 67 km. Next shopping possibility (Cala Murada) in approx. 300 m. Airport Palma in approx. 62 km. Sea in approx. 700 m. Sandy beach in approx. 700 m.
Being the biggest of the Spanish Balearic Islands, Majorca is a popular destination among sun lovers. On Majorca, Club Villamar offers forty luxury holiday homes. 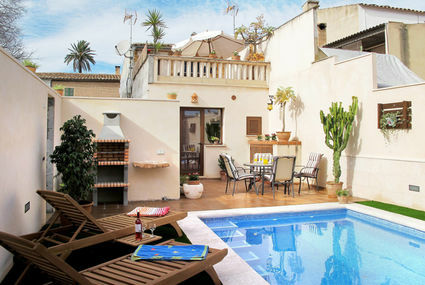 Majorca is known for its sunny weather and because of that, each holiday home has its own private pool. During the day you can laze away at the beach, take an occasional dip in the sea and at night some more relaxing by your own private pool, all that’s possible with a holiday home in Majorca. Because the island is fairly small, all the places of interest can be easily reached. You’ll find several coastal town that are mainly focussed on the beach life, but also some more authentic town, nature parks and bird preservations. So, whether you like to go out every day or rather relax in your holiday home, Mallorca has more than enough to offer for everyone. If you wish to leave the luxury of your holiday home behind you for a day, Mallorca has enough to keep you busy. Like the north cape of the island, where you’ll find Cap Formentor, a spectacular rock formation with steep cliffs. For those who rather lie at the beach all day, there are several small sandy beaches in the eastern and south-eastern part of Majorca. The evenings can be spent in peace and quiet with a glass of wine in the garden of your holiday home, but Majorca also has a large range of fine restaurants, discotheques, bars and cafés. The next day you’ll wake up by taking a dip in the pool of your holiday and decide on how to spend the rest of your day. Take a walk in the mountains of Serra de Tramauntada, go for a bike ride or enjoy some water sports at the beach. Whether you’re looking for an active holiday or just want to relax, with a holiday home in Majorca everything’s possible. During your stay in one of our forty holiday homes in Majorca, we highly recommend you visit the capital of the island. The centre of Palma de Majorca has an historic and picturesque atmosphere, with the 13th-century cathedral of La Seu is quite an impressive sight. In the town centre you’ll also find the shopping area Plaza Mayor, inspired by the square of the same name in Madrid. Here you can do some serious souvenir shopping, just as well as in the main shopping street Carrer Sant Miguel. In between shops you can catch your breath at one of the many outdoor cafés, while being entertained by street artists. More than enough to talk about, when you’re enjoying the evening sun in the garden of your holiday home. Palma de Mallorca of course also has its own beach: Playa de Palma. This beach is particularly suited for families with children who are staying in a holiday home near Palma de Mallorca. The sand gradually slopes down into the sea, which makes it safe for children. 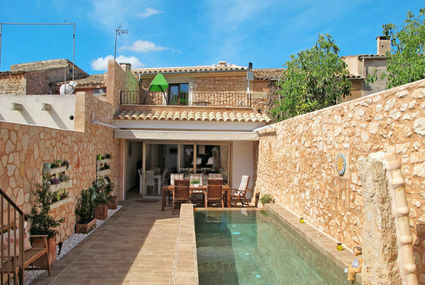 But also for groups of young holidaymakers, a holiday home near Majorca’s capital is an interesting option. The city has many cafés and bars, which are mostly located around the cathedral. Tito’s is one of the most famous discotheques and has been the centre of Majorca’s nightlife since 1923. With six bars, divided over three floors and a glass elevator that offers great view over the bay of Palma, this is a place you must have seen in Palma de Mallorca!